Trust Me, director Clark Gregg’s first effort behind the camera since Choke, hits DVD today. Gregg also wrote and stars in the pic as a down-on-his-luck agent for child actors who discovers a 13-year-old acting prodigy (Saxon Sharbino) and must subsequently deal with her overprotective father (Paul Sparks), an untrustworthy producer (Felicity Huffman), and his nemesis (Sam Rockwell) in order to get himself back on top. It’s the aforementioned nemesis that this clip focusses on, going behind the scenes for a look at Rockwell and having some fun with his sleazy character. Hit the jump to watch the Trust Me clip (you can also check out the trailer here). The film also stars Amanda Peet, Allison Janney, William H. Macy, Molly Shannon, and Niecy Nash. Trust Me is now available on DVD. 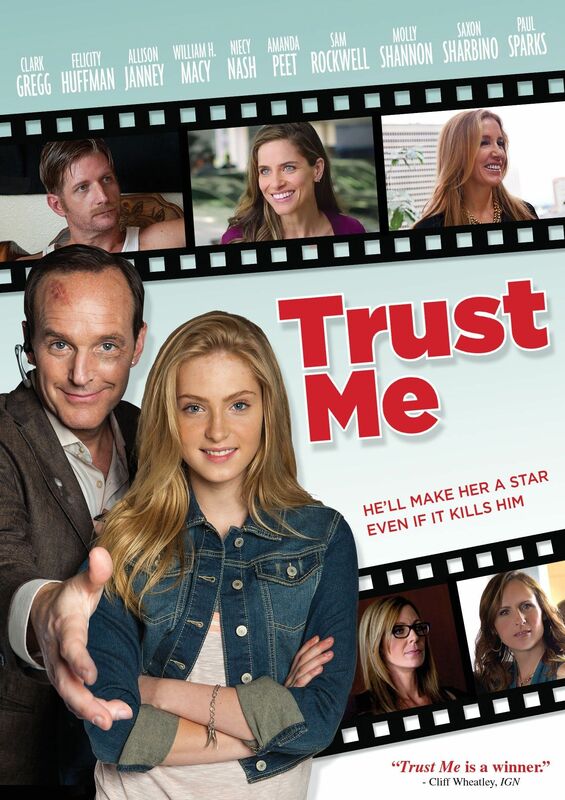 For more on Trust Me, watch our exclusive video interview with Clark Gregg. Clark Gregg leads an all-star cast in this sharp comedy as Howard Holloway, a down-on-his luck agent for child actors and truly one the last good guys left in Hollywood. After discovering a 13-year-old acting prodigy (newcomer Saxon Sharbino), he is poised to close the deal of a lifetime which would catapult his tween client and, at long last, himself, into the big time. With the support of his gorgeous new neighbor (Amanda Peet), he must wrangle the actress’ volatile, overprotective father (Paul Sparks), dodge a scheming producer (Felicity Huffman), and outwit his uber-slick nemesis (Sam Rockwell). As he arrives on the brink of the Hollywood dream that’s eluded him for a lifetime, he begins to sense that his innocent young starlet may not be quite what she seems. Also featuring Allison Janney, William H. Macy, and Molly Shannon.